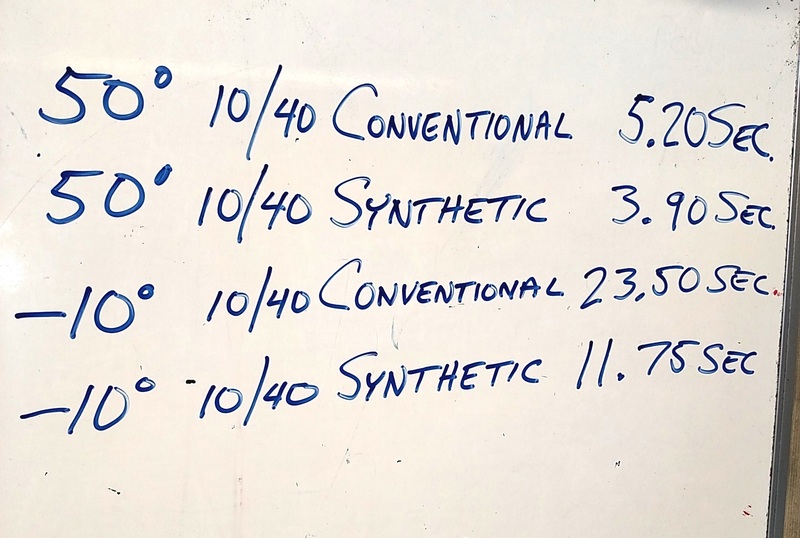 Synthetic vs Non-Synthetic Motorcycle Oils At Start-Up! It was a COLD winter morning in the winter of 2016! How cold of a morning? It was -10F. That COLD! So, why am I just now telling you what happened last winter? Let’s go back to that cold day. I was out, working in the shop, and the heater was set at 50 degrees. Now, that may sound cold to most of you, but when the weather stays so cold for a long period of time, 50 degrees is actually comfortable (at least to me). I had a TIG welding class that day and a student asked what was covered up outside the front door of the Brew Shop. It was an oil delivery from Spectro. When I left the night before it was dark and I just plain forgot to bring it in. The student asked, what does leaving it in the cold do to oil? I started telling him how it would be very thick and that the oil would be as thick as molasses in a cold motorcycle engine. Now, we started chatting about motorcycle oil vs. automobile oil, and then synthetic vs. non-synthetic oils. I know people say I use this car oil and mine doesn’t have any problems. But, you know, motorcycle oils are made for air-cooled, high revving performance engines. I know someone that brought a tail light for me to put on his bike. It was a beautiful piece of workmanship and cost him over $300 plus shipping. Yet, the same person would not spend the extra money for oil made for motorcycles. I just don’t get it. I love working on engines and making them go faster. I have been building my own race engines for 43 years and am now packing to head to Bonneville to race an engine I built. A few extra dollars on the oil makes sense to me. At that time, I noticed a mason jar in the front window, and yes, it was empty! So, I took this empty Mason jar and asked Bob to time how long it took to fill it to the top with the oil. I had some oil already in the shop, which again was 50F degrees and I still didn’t want to go out and get THAT COLD, so, we tested these first. The non-synthetic I poured first and it took 5.20 seconds. Next, I poured the synthetic and it timed out at 3.90 seconds. Same make oil, only one was synthetic and the other was non-synthetic. So yes, there was a difference which surprised me. But I still was thinking the times to pour out the oils at -10F degrees would be close. As I went out to get the other two cases of oil left out all night, the bag the delivery man put them in was now covered with snow and ice. I kicked and beat at it and it finally came loose and I brought it in to the now seemingly HOT 50F shop! The first -10F degree oil was the conventional, non-synthetic, 10w40. It took so long to pour out! A whopping 23.50 seconds to be exact. Then, it was time to test the synthetic 10w40. It only took 11.75 seconds. What a HUGE difference! Back to why I am just now telling you what happened. Soon, the nights will get cooler and then cooler days. After seeing these results, what oil are you thinking about running? I now use synthetic for all seasons, in all my bikes. I think it is worth the few extra bucks. You? I assumed the same result you had expressed, so I was surprised when your test showed a different result. Since I live in Arizona now and our temperature hit 110 degrees this week, I believe that synthetic should run cooler. I always wondered if there really is a difference between automotive and motorcycle oils. Since I have BMW K bikes which are just like the car engines it wouldn't matter. I always figured it was an advertising ploy. It would matter with my BMW air cooled bikes. I was originally from Ohio and I remember how hard it was kicking over a bike in cold weather. Yeah, I started riding 50 years ago when none of the bikes that I would buy had an electric start unless you could afford a new Harley. We run oil coolers on all of our Harleys in Arizona and use 70 wt oil to protect our engines from the excessive heat. I found it interesting that when I asked my BMW dealer about putting an oil cooler on my BMW air cooled bike in 1978 that he said they just put deep sump oil pans on them that held an extra quart of oil. I never had a problem with the BMWs overheating, but we did have problems with the Harleys at the shop I worked at in the late 70's. The 97 Spcn Panhead that I'm selling on Chop Cult has had an oil cooler from the day it was licensed although it is covered in winter. JASO MA2 - Bikes with Catalytic converters etc.. I wont get into all the 2 stroke stuff! So - Automotive oils and Motorcycle oils are basically the same Base Oils (synthetic or non) VI improvers (makes it a 10W40 or 20W50) but when you move into the additives things go their separate ways. Also - To the guy who will inevitably say "I have run PCMO in my bike for years and never had a problem" - I say god bless you. Just know as PCMO's continue to change, the problems you have evaded (or don't know you have) will eventually come to pass. It's your bike. And - Have I dropped PCMO in my bike in a pinch? Yep. I have! Informative article, Thanks Steve and Southside for your input. P.S. Southside you have sparked my interest, just curious about your 2 stroke opinion as well. 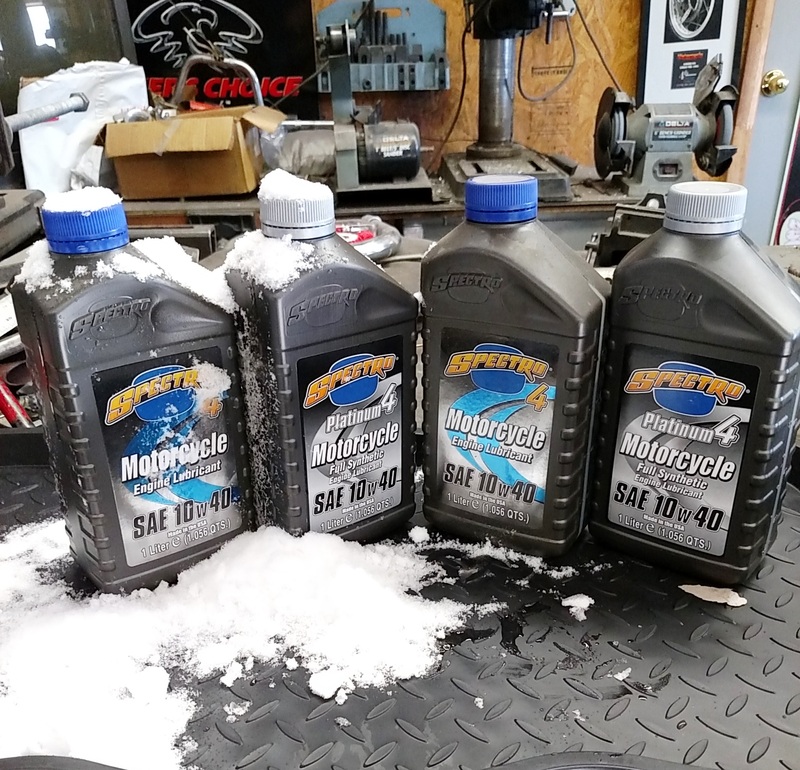 This article seems to be suggesting the oil with lower viscosity (synthetic) is better during start up and cold weather conditions and it makes sense, the faster the oill gets to where it needs to go the better. However I think a point may be missed and that is if the oil with a lower viscosity flows quicker, then it follows that it would drain away for the cylinder walls faster, leaving less oil available for engine starts. The oil with the higher viscocity would flow slower when cold and therefore it may leave more oil in contact with the cylinder walls providing more lubrication during engine starts. I don't pretend to be an expert but I'm just suggesting that there are more things to consider when choosing an oil for your bike. As long as you choose the correct weight for your conditions and change the oil as specified by the bike manufacturer all good motorcycle oils should be fine. 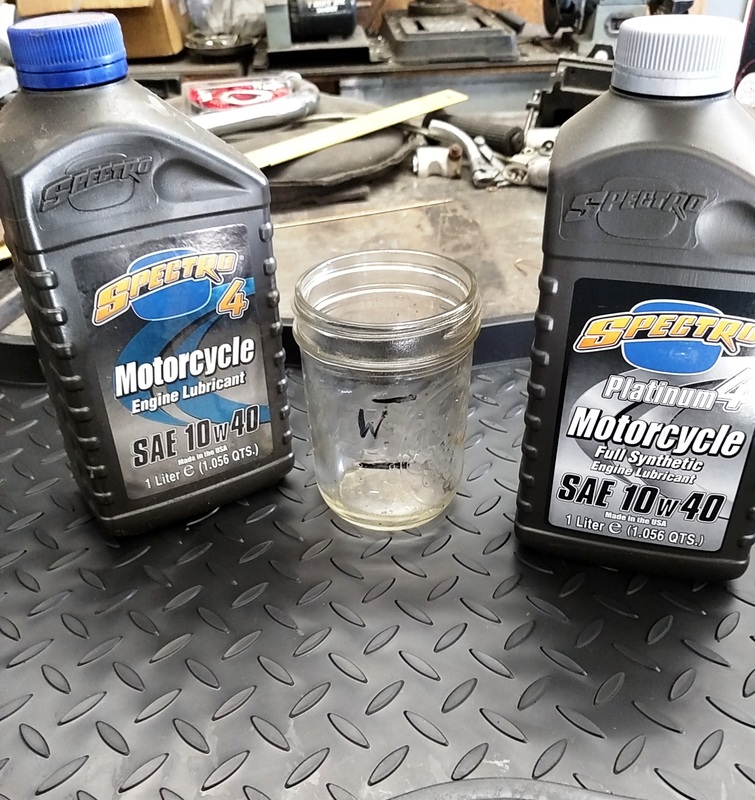 I have started using Spectro oil, but I stick with the conventional type, as it has a high zinc level, which my older bikes require for proper protection. I don't ride in cold weather, so the test results above, would not concern me at all.